Kris Merrill was a survivor. She’d lost her parents as a young girl, and she’d been forced to flee the dubious shelter of her aunt’s home at thirteen to escape the unwanted attentions of her uncle. She’d lived on the streets of San Angeles, finding refuge in the lowest level of the city. When she got the chance, Kris found a room to rent on Level 2, earning a precarious living as a motorcycle messenger, a courier delivering sensitive materials the megacorporations would not trust to any method that could be hacked. 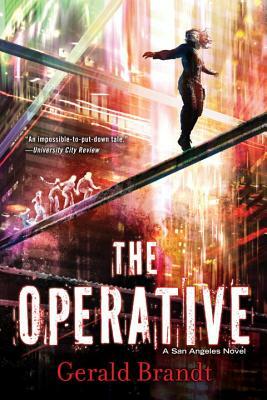 A year ago, Kris’s life changed irrevocably when a delivery went terribly wrong, and she was targeted for termination by the Meridian corporation, one of the most powerful of the megaconglomerates that controlled the government. Salvation came in the form of Ian Miller, who rescued Kris from certain death, recruiting her for the underground resistance group of which he was a part. Since then, Kris has been hidden with the resistance, training to become an operative. Just as her training with the anti-corporate movement is nearing its end, their compound is destroyed by surprise attack. Ready or not, Kris and the other trainees are recalled to the dangerous metropolis of San Angeles. But their transport is shot down and Ian Miller, the man she loves, is captured. Someone, it seems, is using him to get to Kris. Gerald Brandt is an author of Science Fiction and Fantasy. His first novel, The Courier, was listed by the Canadian Broadcasting Corporation as one of the 10 Canadian science fiction books you need to read. By day, he’s an IT professional specializing in virtualization. In his limited spare time, he enjoys riding his motorcycle, rock climbing, camping, and spending time with his family. He lives in Winnipeg with his wife Marnie, and their two sons Jared and Ryan. You can find Gerald online at http://www.geraldbrandt.com, on Facebook as Gerald Brandt – Author, and on Twitter @geraldbrandt.